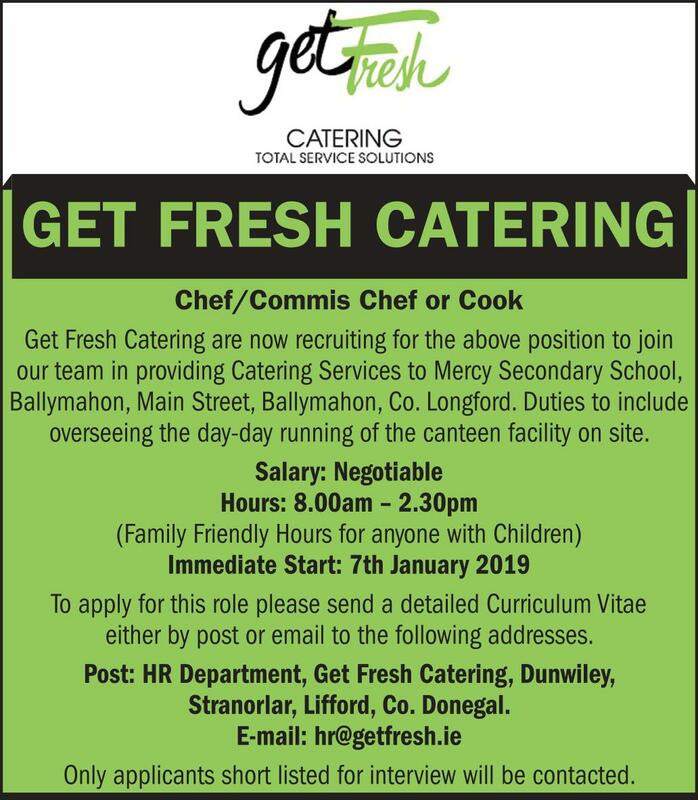 Get Fresh Catering are now recruiting for a Chef / Commis Chef or Cook to join their team in providing Catering Services to Mercy Secondary School, Ballymahon, Main Street, Ballymahon, Co Longford. The ideal candidate will be responsible for overseeing the day-to-day running of the onsite canteen facility. The successful candidate will have worked at senior kitchen level for a minimum of 2 years and have working knowledge of HACCP, portion control, stock purchasing, staff management and food hygiene training. In return successful candidates will be rewarded with a generous remuneration package and favourable working hours. Only applicants short listed for interview will be contacted. To apply for this role please send a detailed Curriculum Vitae either by post or email to the following addresses. All CV’s received will be kept strictly confidential and only visible to our HR Department. Your application will be retained up until the post has been filled.